Thanks JC for this breeding. Sire of: CH NEEKA, CH BIG BROTHER, CH DRAGONFIRE, CH NEGRA, CH LUTHER and many winners. 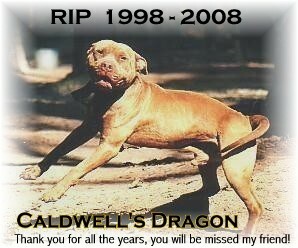 THE LAST LITTER SIRED BY DRAGON, BRED BY TANYA @ COLD STEEL PITS WAS BORN JUNE 1, 2007 - DRAGON DIED AT THE END OF DEC 2007, ALMOST MADE IT TO 2008. He was produced when CSP took Ch Polly to JC in 1998 and bred her to Ch Gator. He was one of 6 puppies born. He was one of CSP's foundation Studs and produced many fine bulldogs for them.